Plasmonic optics is an emerging research field that combines electronics and photonics with nanostructures. It studies the interactions between electromagnetic waves and matter at the nanoscale. This Tutorial Text provides an introduction to plasmonic optics with distinct concepts and typical applications. Readers will learn about the physics and applications of nanoscale photophysics, leading to better understanding of the fundamental properties of photons in nanostructure materials. Topics include the physical basis of plasmonics, the extraordinary transmission of nanohole arrays, scattering enhancement of nanoparticles, perfect absorption of metamaterials, and nanoantennas for light radiation. Plasmonic optics - an emerging research field - combines electronics and photonics with nanostructures. It studies the interactions between electromagnetic waves and matter at the nanoscale. The prominent feature of plasmonic optics is the coupling of electromagnetic waves into collective electron oscillations. This peculiar feature enables the localization and enhancement of electromagnetic energy in a novel family of nanodevices, nanoelectronics, and nanosensors. Plasmonics involves many subjects, such as optics, physics, materials, and even chemistry. So far, it has favorable applications in chemical sensors, high-resolution microscopy, photovoltaic cells, biological detection, communication, and medical diagnosis. Each achievement plays a significant role in improving the future. Federico Capasso, while receiving his 2013 SPIE Gold Medal Award, said, "You can't go wrong becoming a very strong optical scientist because you can work in many different fields." Plasmonics is one such field. Many researchers have devoted themselves to it over the last few decades because it provides a compelling risk and promise. That is what makes science so attractive: we are eager to understand the unknown. In fact, we are attracted by the risk to find the next achievement around the corner. 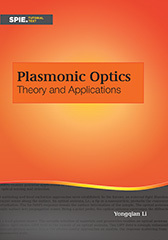 To fulfill the promise offered by plasmonic optics, this book presents a brief introduction to the theory and applications. The first chapter introduces the optical properties of materials. An elementary description of electromagnetic theory is provided. Noble metals, dielectric materials, and semiconductors are frequently used in plasmonic optics; their optical properties are described in terms of the Drude and Lorentz theories. Although the effective optical properties of nanostructures deviate from those of bulk materials, the penetration depths and skin depths play a crucial role in defining plasmonic properties. The end of the chapter discusses the effective medium theory for composite materials. Surface plasmon polariton (SPP) is a recurring term that requires a clear definition. In this book, SPPs refer to a collective electron oscillation and the associated wave fields that propagate along a metal-dielectric planar interface. Surface plasmon modes are sometimes used to describe the resonance cases of SPPs. When the electron oscillations occur on the curved surface of nanoparticles, these phenomena are called local surface plasmon resonances (LSPRs) because, in most cases, only the resonance conditions of oscillating charges in nanoparticles are considered. Chapters 2 and 3 address the physical concept and typical applications of SPPs and LSPRs. The scattering and absorption properties of nanoparticles with various geometries are discussed in terms of the Mie theory. The concepts of SPPs and LSPRs are applied to a series of unusual optical properties/devices: extraordinary optical transmission (OET) through a single aperture or hole arrays (Chapter 4), the waves guiding and confined by the metal-insulator-metal (MIM) and insulator-metal-insulator (IMI) nanostructures (Chapter 5), the radiation/emission enhancement, and the perfect absorption achieved by an optical antenna from visible to infrared wavelengths (Chapter 6). These chapters discuss nanostructures with various geometries for the purpose of achieving plasmonic sensors, including chemical sensors, biosensors, and surface-enhanced spectroscopy. Chapter 7 briefly introduces the nanofabrication techniques aiming at plasmonic devices. Top-down material-removal methods for elaborate nanostructures, bottom-up synthesis for self-growing nanoparticles, and solution phase methods for assembly geometries are introduced. The optical characterizations of plasmonic nanostructures are briefly reviewed; characterization methods benefit from the significant progress of plasmonic optics and advance its progress in return. A vast number of applications and various geometries for SPP-enhanced sensing are referenced throughout the text. There is extensive literature contributing to this field. References were selected because of their descriptions of a particular effect or their suitability for a beginner. I would like to thank the authors of the literature cited in this book. I had to omit a few topics associated with plasmonics due to the scope of this book. These topics include but are not limited to plasmonic cloaking and transformation optics, plasmonic lasers, electromagnetically induced transparency, metamaterials, and metasurfaces; the latter two are huge areas that could be covered in their own texts. Numerical simulation methods are not provided in this book, but interested readers can find them in various available commercial and free software. This Tutorial Text should provide a readable introduction to plasmonic optics with distinct concepts, typical applications, and comprehensive knowledge. A modest amount of primary background knowledge in electromagnetism is sufficient to understand the concepts discussed here. I very much hope that more graduate students and young researchers pursue careers in this fascinating area. Their participation would further enhance the field and help plasmonic optics improve our future life. Any comments and suggestions are very much appreciated.